Celebrate exotic plants in an exciting new way with this Ancient Graffiti Kinetic Ginkgo Leaf Vertical Wind Spinner. Recognizable ginkgo leaves adorn four arched and spiraling rods, bringing striking height and style to your garden in moments. These accents encircle a center, iron rod, and can spin in the wind for moving garden sculpture. 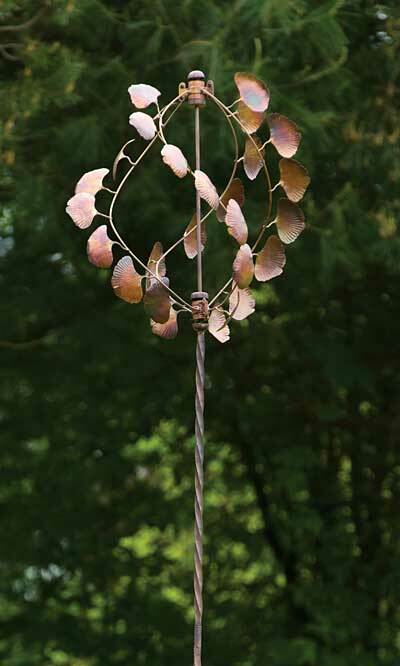 A 48" tall, twisted iron shaft provides plenty of height to the topper, and the curved and slightly cupped shape of each leaf helps capture the wind. Depressed lines on them, along with a scalloped edge and thin stem, create recognizable shapes to further the motif. A 15" wide, trident base inserts into soil easily thanks to its pointed ends, and provides stability for the spinner. The flamed copper colored finish enhances the natural appeal, thanks to its wealth of brown and tan tones. Crafted from iron, this accent remains lovely and durable in your yard for many seasons. Place a dynamic tree shape in your lawn using this Kinetic Ginkgo Leaf Vertical Wind Spinner. Assembly required.